An attractive contemporary designed beachfront villa of sumptuous proportions, with beautiful sunset sea views. Amenities satellite LCD TVs, DVD/CD players, iPod docks, WiFi broadband internet, full air-con, fully equipped kitchen, BBQ, sea kayaks. Baan Ora Chon is a sumptuous contemporary designed beachfront villa, with generous proportions, and stunning sunset-facing sea views. Located on the powder white sand beach of Lipa Noi on Koh Samui’s west coast, Baan Ora Chon is ideally situated for a relaxing holiday in luxurious comfort. Roofed in wooden shingles, the villa features high vaulted ceilings and large glass walls that create a great sense of space. Entered through large wooden gates, an impressive walkway along landscaped gardens leads the wide staircase to the main living pavilion. The open-plan living room on the upper floor includes a TV lounge, with sofas arranged around a wall-mounted plasma screen, a formal dining table seating 8, and a large balcony overlooking the pool and sea beyond. Glass doors and windows run almost entirely around the living room, creating a very cool, light, and comfortable space. To the right of the main entrance, stairs lead across a central water feature to the adjacent two-storey building. Upstairs is a bedroom with a private dressing area and a large en-suite bathroom, including an outdoor terrazzo tub. A balcony overlooks the entrance garden, and a larger balcony faces views over the front gardens, the pool and beach. Below is an en-suite bedroom that can sleep 2 children or 1 adult, on a single bed with a second pull-out bed. Stairs from the living room descend to the stylishly appointed kitchen, adjacent to which is a second casual lounge/TV room. Both rooms have glass doors leading out onto a patio and the landscaped garden. A flight of stairs from the patio lead to the second bedroom below the living room. The bedroom has an en-suite shower room and a private covered terrace facing the garden, pool and sea. The 6.6X18m infinity-edge swimming pool is surrounded by sand-wash deck, and furnished with cushioned sun-loungers and parasols. A pool-side sala pavilion incorporates a bar, with submerged stools within the pool, a BBQ kitchen, and a dining table seating 10, ideal for al-fresco entertaining in the balmy tropical air. Flanking the pool on a raised terrace are two further bedroom pavilions, separated by a garden. Each bedroom has a dressing area, and an en-suite bathroom with an outdoor terrazzo bathtub. All 4 main bedrooms have king-size double beds. A large lawn interspersed with coconut palms leads down to the beach. The beach at Lipa Noi is one of the finest on the island, with powder white sand, good swimming conditions, beautiful views of nearby islands and spectacular sunsets. 4 or 5 bedroom sleeps 9 or 8+2. * Balance payment is due 90 days prior to arrival. 30% off booking made within 30 days of arrival. Applicable to all occupancy rates, and cannot be used in conjunction with other promotions. Not applicable for Xmas/NY. 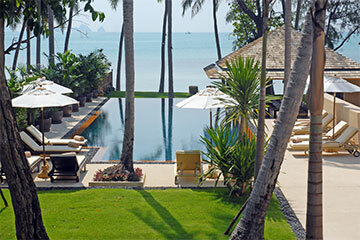 10% discount when booking with Baan Kilee or Baan Puri, or 15% discount when booking all 3 villas. Applicable to full occupancy rates only. Not applicable for Xmas/NY. 15% discount for booking made 150 days or more in advance, except for CNY and Easter, when 5% discount applies. Applicable at full occupancy rates only, and cannot be used in conjunction with other promotions. Not applicable for Xmas/NY.